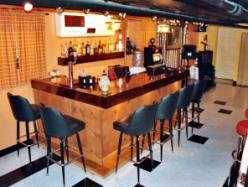 The EHBP-02 basic l-shaped bar is another simple design that's great indoors or outdoors. 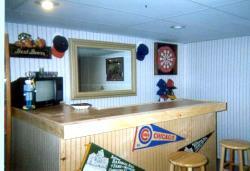 For basement, patio or garage use. 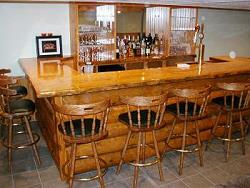 It is our easiest L-shaped bar configuration and a great project for the first time builder. 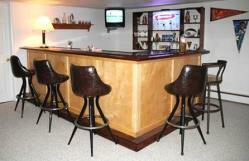 Site membership also includes the more advanced EHBP-04 L-shaped wet bar design. 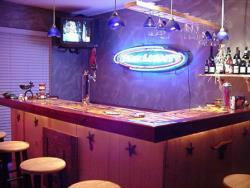 Designed as an inexpensive beer serving bar. This model is a college frat house favorite. 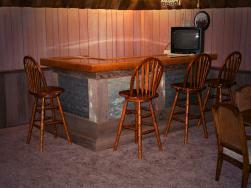 Sturdy yet easy and inexpensive to build. Indoor or Outdoor use. For outdoor use, simply substitute AC2 treated lumber. Start building today! Layout the two base frame sections. 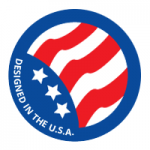 Construct four upright supports as detailed in the plans. Assemble top connector supports on both leg sections. Apply sheeting to sides, front and floor panels. Cut, fit and fasten the bar top. Cut and assemble the arm rail and foot rest. Chicago style arm rail is optional. Add optional trim then sand and apply finish. Did your know? A single four-foot long 2x4 stud when placed upright can support well over 2000 lbs ? Layout: Symmetrical, for left or right-handed layout. Duplicate corner framing for a U-shaped layout. 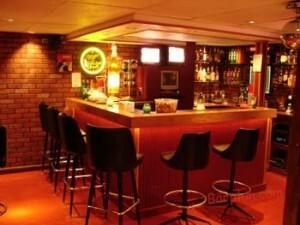 This L shaped bar is suitable for indoor or outdoor use. 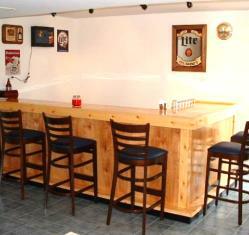 Area behind the bar is available for custom shelves or modular bar equipment. Now CHBD Ready! 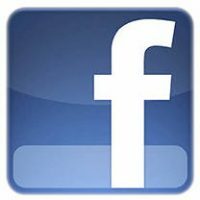 Fully Symmetrical Design for right or left-handed layout. Variable Length Width and Height using the CHBD Resizing Tool. Can be easily modified for a 45 degree corner. Space for top sink.Convenient Foot Rest. Beer gutter area for mixing drinks. Easy Arm Rail, or use pre-made arm rest molding. Plenty of space behind for storage shelving or fridges. 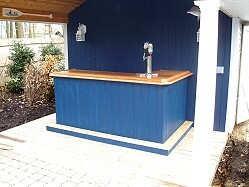 Can be built as a movable bar or permanent installation. 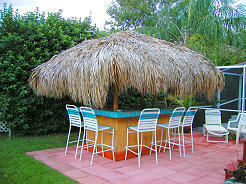 Decorate with bamboo & thatch for a great tiki bar. Build base model for under $200 in materials.